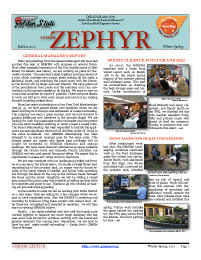 The Zephyr is the official Newsletter of the Golden State Model Railroad Museum and the East Bay Model Engineers Society. The Winter-Spring 2012 issue of the Zephyr has been released! Please download an electronic copy by clicking on the cover pictured on the left. NEW ! Our 1960 - 1980's "Clinkers and Sparks" Newsletter Archive ! For questions and comments to the Zephyr editors, or to subscribe (if you are not a GSMRM member - GSMRM members do get copies by e-mail whenever issued) please email zephyr@gsmrm.org.